Please refer to our stock # 3290 when inquiring. 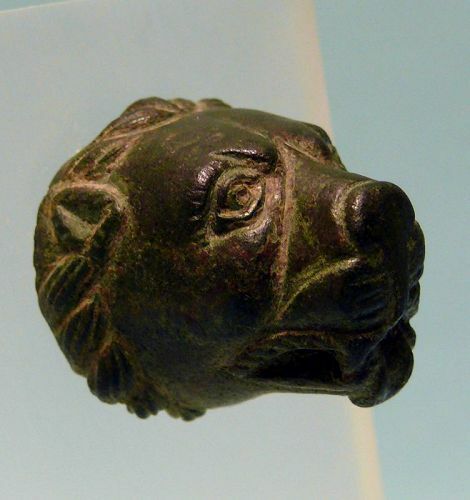 Roman Bronze Head of a Lion, attachment, protome, 2nd - 3rd Century CE. Finely incised with pleasing face and curly mane. In excellent condition, 1 1/8" x 1 1/4" x 1 1/8", on stand height is 3 3/4". Ex: S. Beiner collection, Florida. Lions have been celebrated throughout history for their courage and strength. They once roamed most of Africa and parts of Asia and Europe. Today they are found only in parts of sub-Saharan Africa, except for one very small population of Asian lions that survives in India's Gir Forest.